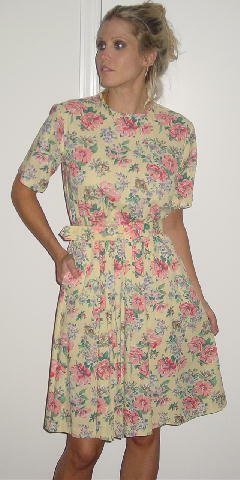 This vintage dress is 50% polyester and 50% rayon and is by Blair. It has a jewel neckline, short sleeves, an elastic waistband, and front diagonal pockets. 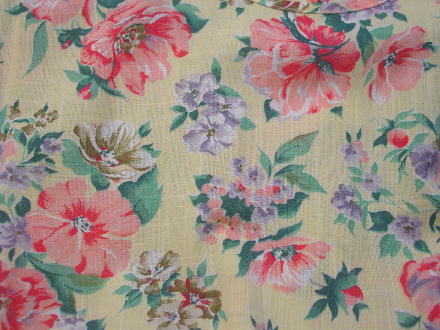 It has a yellow background with flowers and leaves in white, grays, coral-pink, red, olive green, and light and medium green. 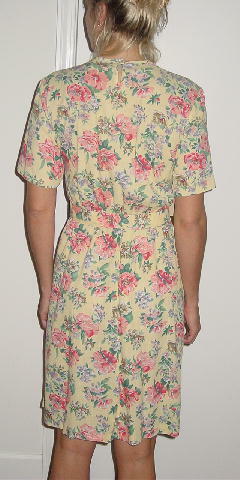 Below the back neckline is a 3" long keyhole effect with a top iridescent yellow one button closure. There are belt loops and a fabric matching belt with a round clear plastic buckle. shoulder to shoulder 16 1/4"
shoulder to hem 40 1/4"
armpit to armpit 18 3/4"
belt 35" by 1 1/8"
1st hole 31 3/4", last hole 28 3/4"